Question: Respected doctor, am 45 years old women, am suffering with bloating abdomen, constipation, acidity, heart burn, pain in abdomen, loss of appetite, its related with food like chicken, fish or other non veg foods, when i eat these foods am suffer much bloating abdomen with pain in stomach, some time nausea and vomiting also. i underwent many Treatment but no effect, Doctors told its due to gall bladder stones, how gall stones forms? Is there is any treatment in Homeopathy system of medicines for gall bladder stones? Doctor Answer: Dear madam, No worries, Homeopathy treatment helps for you, please find the complete details about gall bladder stones, below. Proper treatment helps you, you need to consult the doctor in person to rule out your doubts. The gallbladder contracts and pushes the bile into a tube—called the common bile duct—that carries it to the small intestine, where it helps with digestion. Cholesterol stones are usually yellow-green and are made primarily of hardened cholesterol. Pigment stones are small, dark stones made of bilirubin. Gallstones can be as small as a grain of sand or as large as a golf ball. The gallbladder can develop just one large stone, hundreds of tiny stones, or a combination of the two. Gallstones can block the normal flow of bile if they move from the gallbladder and lodge in any of the ducts that carry bile from the liver to the small intestine. · Family history. Gallstones often run in families, pointing to a possible genetic link. · Weight. A large clinical study showed that being even moderately overweight increases the risk for developing gallstones. The most likely reason is that the amount of bile salts in bile is reduced, resulting in more cholesterol. Increased cholesterol reduces gallbladder emptying. Obesity is a major risk factor for gallstones, especially in women. · Diet. Diets high in fat and cholesterol and low in fiber increase the risk of gallstones due to increased cholesterol in the bile and reduced gallbladder emptying. · Rapid weight loss. As the body metabolizes fat during prolonged fasting and rapid weight loss—such as “crash diets”—the liver secretes extra cholesterol into bile, which can cause gallstones. In addition, the gallbladder does not empty properly. · Age. People older than age 60 are more likely to develop gallstones than younger people. As people age, the body tends to secrete more cholesterol into bile. · Cholesterol-lowering drugs. Drugs that lower cholesterol levels in the blood actually increase the amount of cholesterol secreted into bile. In turn, the risk of gallstones increases. Pain under the right shoulder. Notify your doctor if you think you have experienced a gallbladder attack. Although these attacks often pass as gallstones move, your gallbladder can become infected and rupture if a blockage remains. 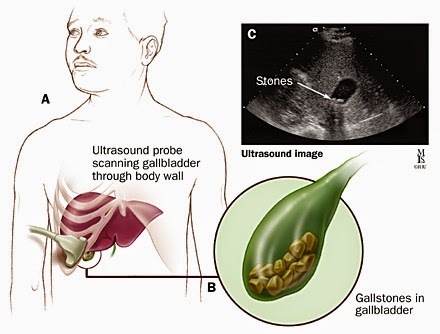 Many people with gallstones have no symptoms; these gallstones are called “silent stones.” They do not interfere with ggallbladder liver, or pancreas function and do not need treatment. Non surgical approaches are used only in special situations—such as when a patient has a serious medical condition needs surgery—and only for cholesterol stones. Stones commonly recur within 5 years in patients treated non surgically. Symptomatic Homoeopathic medicines works well for gall bladder stones.